Linguistic Note: the word may be of Egyptian origin from Heq-Maa, Mother-of-Magical-Knowledge, a title of Isis, Lap-of-Power. On the other hand there seems some possibility that the word is grammatically masculine, not feminine! Greek Gnostic (translation of the name), sophia, wisdom, variant hagia sophia, holy wisdom. Latin Gnostic, sapienta, wisdom. Description: Mother of the stars and the seven planetary powers; Greatly revered Virgin in Whom the father was concealed from the beginning before he created anything; She Who cast Her shadow on the primeval waters; Queen; Lady Wisdom; Mother of all; all Maternal Being; She Who sent Her spirit in the form of the serpent Ophis to earth to teach humanity to ignore the jealous God (the serpent was also called Christ); Fairer than the sun and above all constellations, Goddess of heaven, understanding, compassion and spiritual transformations; Artificer and re-newer of all things; All-powerful; All-surveying; She Whose bright shining penetrates and pervades all things; Light of knowledge; Bestower of the spirit, mind and consciousness in humanity; Holy Inspirer of clear thinking especially in all matters of morality and religion; Matron and Teacher of philosophers; Inspirer of poets; She Who gathers the Arts around Her. 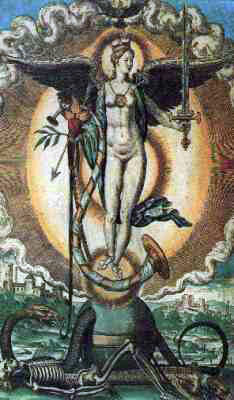 To Whom Sacred: dove; the five planets; the sun and moon; the number 7; seven pillars (Her temple is 7 pillared). Male Associates: Sons:, Hebrew Ilddabaoth, Son-of-Darkness, alternate name for Jehovah. Messias, Anointed-One, Saviour, (translated by the Greek: Khristos), by Jehovah. Mother of Achamoth, ----, below. The Gnostics called Her Anima-Mundi, Soul-of-the-World, below. Her name may be of Egyptian origin from Heq-Maa, Great-Magician, Who is linked with Heket, Great-Magician. She was adopted by Medieval Europe as Philosophia, Love-of-Wisdom. Her serpent form is Ophis, ----. The Kabbalistic form of Her is Shekhina, Divine-Indwelling-Presence. Daughter of Gnostic Sige, Silence, below. Adopted by Greek Gnostics as: Sophia, Wisdom, below. Description: Life-giver to the elements and the terrestial world; Ancestress of men. Daughter of Hokhma, Wisdom, above. Linguistic Note: mundi, world. Related English word: mundane. Gnostic form of Hebrew Hokhma, Wisdom, above. Also seems an appropriate title for Psyche, World-Soul. Forename of Sophia, Wisdom, (below), Hagia-Sofia, an alternative translation of which is Female-Wisdom. Description: Primordial Female Power; Creatress; She Who represents the state of chaos and non-existence before the universe took form; Grandmother of God; She Who stands at the beginning of all things from whom the Word was born. Mother of Hokhma, Wisdom, above. Geography/Culture: Gnostic (their language was Greek). Linguistic Note: sigma-omikron-phi-iota-alpha, 1. skill in handicraft and art. 2. Sound judgement, intelligence, practical wisdom. : cunning, shrewdness, craft. 3. Wisdom. Related English word: Philo-sophy. Description: Goddess of counsel, sound wisdom, understanding, witty inventions, inspiration, the arts, prudence, justice and strength; Bestower of sovereignty; "All who hate Her, love death: those who find Her find life"; She Who is better than rubies. The Gnostics identified Her with the Holy Spirit of the Chiristian trinity. To Whom Sacred: white-rose; seven pillared temple (which She built for Herself). Translated adoption of Hebraic Hokhma, Wisdom, above. Equivalent to Western Medieval Philosophia, Lover-of-Wisdom. Christianized as Saint-Sophia, see below. Source: Graves WG 157, 255. Closely associated with MARIA/x by the early church. Christianized form of Gnostic Greek Sophia, `Wisdom'. Mother of Spes `Hope'. The Triple Christian, Fides, Faith, Spes, Hope, and Charitas, Charity, were born from Her smile. worked on: December, November 1995; August 1991.